When we talk about “conversions” we’re usually talking that moment when someone buys something, completes a subscription form, or signs up for an online service. Everything is done online. For a locally-focused business with a physical location, a conversion is that moment when someone calls them or visits. It’s not as easy to measure. When someone searches for your local business, Google offers a “local three-pack,” three listings that best fit based on the keyword searcher enters and their location. As you might guess, these results are hugely important to your success. 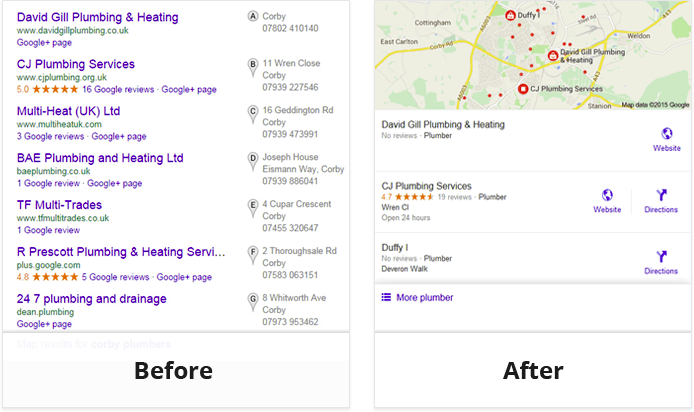 Google local search results before and after introducing the 3-pack SERPs. The local three-pack listing can actually list your Google reviews along with your business name and your overall rating. All of this is displayed right there in the SERPs (search engine results pages). If you have positive reviews, this can get your business chosen over competitors. But how often do people click on your listing, visit your website, or pick up the phone based on your reviews? I recently analyzed over 22,000 Google local listings to see just how much power Google reviews have over search engine rankings. What I found surprised me. Google reviews affect search engine visibility. Google reviews are displayed right there in the SERPs. [pullquote]Consumers who perform local searches are ready to buy and act quickly. [/pullquote] Consumers put stock in online reviews. Though we can’t prove exact causation without more data from Google, I think we can tell how Google reviews likely affect purchasing decisions for local businesses. Before we get to the local search stats, I need to mention that the convergence of search rankings, conversion, and content has to be deliberate. If a potential customer finds you on Google, sees an appealing title and description for your location, they can’t be taken to a website that is thin on details or appears irrelevant to them. They’re not going to convert — to call, visit or buy. Your content has to keep the promise your local search rankings make. The last from-the-horse’s-mouth data we got from Google itself tells us [pullquote]50% of consumers who conduct a local search on their phone visit a local business within 24 hours. [/pullquote] 34% of consumers who performed the same search on their computer or tablet similarly, visited the business within a day. Local search ranking has a direct effect on getting people on your website, through the door, or on the phone. That same Google report stated that 18% of local mobile searches lead to an actual sale within one day. We don’t have any newer data from Google itself, but we do have studies from other organizations. Even if this widely-cited data is dubious, we have better sources that tell us just how big local searches are, and just how quickly local searchers act. But do they click on the local three-pack that contains those aforementioned Google reviews? Since we don’t have any data that comes directly from Google, we have to use studies from other parties. I came across two valuable studies in regards to Google’s local three-pack, which has still been around for less than a year. Casey Meraz published his study at Moz, and Mike Ramsey published his study on his own website, Nifty Marketing. They both used relatively small sample sizes and heat map technology, and their findings weren’t exactly the same. There were some commonalities, however. In the Moz study, Casey analyzed several different SERP layouts. I want to focus on his findings for “The Snack Pack with Organic Results Underneath,” as it’s the most relevant for many local business searches. That’s not to say your audience won’t find any other SERP layouts, and you can find the rest of Casey’s analysis in the linked post. When there’s an organic listing above the three-pack (but under the paid search results), that CTR sees a dramatic decline. In the test that showed an organic result above the local three-pack, it received 68% of the clicks, while the local three-pack only garnered 8% of clicks. He performed one more test, but we’ll get to that in a moment. Next, let’s dive into Mike Ramsey’s research results over at Nifty Marketing. Mike also used heat maps to test click through rates. He studied the CTR results for ‘Boise Injury Lawyer’ and ‘Provo Storage Units’ on both mobile and desktop. In each of his results, organic came out on top. As you can see, there’s a clear difference between Mike’s study and Casey’s study, even though they were posted only seven days apart. The studies used different groups of people. Mike studied and recorded results for both desktop and mobile CTRs, where Casey just mentioned he recorded from “different devices”. Casey personally interviewed, tested, and recorded ten people selecting a bail bondsman from a Google search. Because these were two different studies, each using a relatively small group of people, the actual numbers are different. You also have to keep in mind, the three-pack and its surrounding SERPs can appear vastly different for different searches, and on different devices. These two studies do, however, have one thing in common: reviews. Casey’s referring to the third part of his study, which displayed the local three-pack with organic results underneath, but the key difference this time is that some listings featured reviews and some did not. Results with reviews got more clicks. In addition, he conducted several in-person click tests, where he gave participants a goal and observed their results. In each of his tests, reviews seemed to attract the most clicks. Mike also found reviews seemed to be a big reason for clicks in the three-pack, especially on a desktop. People are paying attention to those Google reviews, but how much do they actually care about reviews? When it comes to consumers and online reviews, we thankfully have a wealth of information available. The statistics from these studies show why people tend to click on the local listings with review stars, and why they might choose those listings over the organic results. Since it’s both recent and reputable, I want to share some findings from Myles Anderson of BrightLocal, who published an eye-opening study last summer. In addition, BrightLocal found the number of consumers who read online reviews for local businesses is increasing. It’s common sense, but it’s nice to put a number to it. Additionally, they found 80% of consumers trust online reviews as much as personal, word-of-mouth recommendations. Last month, I conducted my own Google survey: 54% of the respondents read online reviews before buying from a local business. Luckily for you, your Google reviews are displayed right in the SERPs. Before I read any of these studies, I knew reviews were a big deal for my own marketing clients. But I wanted to know more. Remember that research I mentioned in the beginning of this article? I wanted to know how Google reviews might affect search engine visibility, so I personally analyzed 22,032 local listings. This is recent research that focuses on Google’s three-pack, as any research concerning the former seven-pack and 10-pack are no longer valid. My methods weren’t complicated. I went from SERP to SERP, counting the number of reviews in the first and second three-packs in Google’s local listings. With the help of my two oldest sons, we put the findings in an endless spreadsheet. Then, I analyzed the data and shared my findings. Google reviews seem to have a real effect on search rankings, and the listing with the most reviews seems to come out on top. The three-pack is thought to be an unpredictable landscape. It’s hard to optimize your site to appear in local listings. Now that you know Google reviews matter for ranking in the three-pack, there’s much less guesswork involved. And, as a bonus, reviews are good for much more than just search results. Google reviews matter for ranking in the local three-pack: The first three local results have 472% more reviews than results 4-6. Consumers trust online reviews: 80% trust online reviews as much as personal, word-of-mouth recommendations. Google reviews make a difference when it comes to local listing CTR: In both CTR studies presented in this article, the local listings with reviews outperformed the listings that did not feature reviews. Consumers find local searches more valuable than non-local searches: 61% of searchers find local results more relevant than non-local search results. Local searchers make quick purchasing decisions based off of their search results: 50% of consumers who conduct a local search on their phone, and 34% using a desktop computer, visit a local business within 24 hours. We can’t claim causation here, but we can claim a strong correlation. Google reviews give local businesses a fighting chance in search. They matter for ranking in the local three-pack, and consumers tend to click on local listings with reviews. Organic search isn’t going away anytime soon, and you’ll always need to optimize your content for conversions. Even if you have a plethora of great reviews and strong rankings in the local three-pack, you won’t convert many of your clicks without conversion rate optimized content. Google reviews are huge for search engine visibility for several reasons, and search engine visibility is vital for getting potential customers to your website. Once they’re there, it’s your job to convert them. Brodie Tyler is an Amazon best-selling author, public speaker, serial entrepreneur, and marketer based in the Boise, Idaho area. For over 15 years, Brodie has helped small business clients achieve success through digital and offline marketing. He’s the founder of ReviewJump, a reputation management software startup. Brodie lives with his wife and four children. Nice article. As an entrepreneur, this article is a big help for coming up a strategy especially getting more traffic to your website and getting more sales. Thanks! So as you have listed, getting reviews on your SERP draws the eye and gets qualified searchers who are likely or more likely to buy to visit your site at a higher frequency. Taking this a step further, either ensuring your paid ads have a review extension or a mention of reviews and taking the customer to a page that clearly references the reviews above the fold will be a great addition to your local pack listing. The user will have clicked your ad because of the google reviews, then you explain why you got the reviews on your site for the person who cared about that and clicked your ad for the review you had listed in the first place.